Combine the stunning elegance of a silver heart ring and birthstone with the significance of a promise ring, and this is what you get! 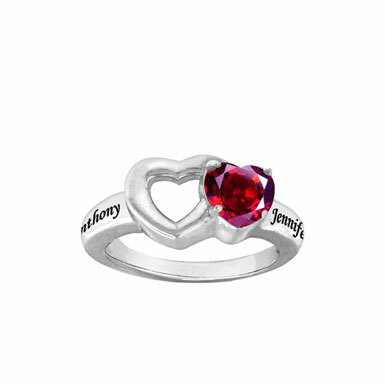 Stunning sterling silver and beautiful birthstone gems accompany this personalized ring. Choose two names up to ten characters long each and they will be engraved into the ring on either side of the heart and gemstone. Mark this special moment in life and give the gift of a truly personalized and unique ring that will be treasured and enjoyed for years to come. Discover the difference Apples of Gold's quality and craftsmanship can make and get a personalized ring that will stand the test of time! We guarantee our Personalized Birthstone Promise Ring with Heart-Shaped CZ to be high quality, authentic jewelry, as described above.